An electrocardiogram (ECG) is a medical test that will detect cardiac abnormalities that the heart gives as it contracts. There are a myriad of issues that will lead a doctor to recommend this test to a patient. They include family history, a battle against diabetes, a case of obesity and the possibility that a patient has high blood pressure, or even that the same patient could be having a heart defect that needs to be zeroed in on. This test is non-invasive and has no known danger. So, what is an ECG test? And what does an ECG measure?An ECG, the abbreviation of electrocardiogram, is a test that measures the electrical activity of one’s heart. The ECG test records the heart’s rhythm on a strip of paper, or shows with a line on a screen. The peaks and dips of the heart’s contraction are then interpreted by a doctor. They will be able to discern any unusual activity. It is instructive to note that this “unusual activity” is used by the doctor to highlight any damage that has been visited on the heart or the blood vessels owing to high blood pressure. How the ECG Test Is Performed? The ECG Test is a non-invasive procedure with no known risks. The mechanics that go into conducting this test are pretty straightforward. Resting ECG: In this test, the medic simply asks you to lie down and rest as your readings are taken. You will be asked to keep still during the test to prevent the interference to electrical impulses generated by other muscles. This test takes only 5-10 minutes. Exercise ECG: In this test, the medic is interested in knowing the condition of a patient’s heart whilst the patient is involved in some heart straining activity. The leads will typically be attached to the individual when the person is on a treadmill or on a fixed bicycle. Ambulatory ECG(Holter ECG): This is achieved by having a monitor strapped on the patient’s body for at least twenty four hours. The doctor is able to examine the hearts activity over an entire day’s period.This test is usually recommended to patients whose symptoms are fitful and those who are under recovery from heart attack. 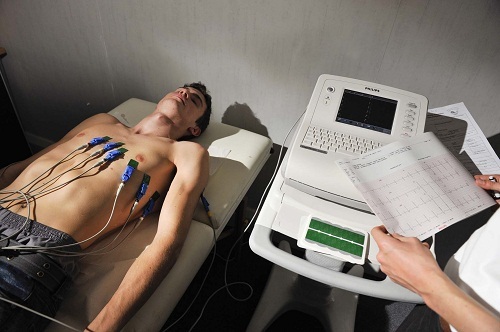 Many people who are about to be subjected to an ECG test are often surprised at the preparation for this test. You don’t need to do much to prepare for this test. Perhaps the exercise ECG will require that one have a pair of training shoes and a sporty attire, but anyone else, being subjected to a resting ECG and a 24 Hour ECG, need not depart from their usual routine. Unusual heart rhythm-A fast heartbeat(tachycardia),unusually slow heartbeat( bradcardia) or any heart rhythm irregularities( arrhythmias) will highlight unusual heart activity and could be a pointer to the fact that the patient is on some drug, prescription or illicit, such as beta blockers, amphetamines or even psychotropic drugs. Unusual heart rate-Under ordinary circumstances, an individual’s heart rate can be measured by feeling their pulse. In the event that the pulse is difficult to feel or too irregular to have an accurate measurement, then an ECG measurement is best placed to give an accurate reading. Inadequate oxygen supply to the heart-An ECG test can also be used to accurately pin point whether the pain that is emanating from the chest has its genesis in either the chocking of oxygen supply to a heart muscle or the existence of a chronic heart condition such as angina. Heart attack-Oftentimes, an ECG test can detect a previous heart attack or one that's progressing. By the patterns on the ECG, a medic can tell which part of your heart has been damaged. Structural malformations-An ECG test can indicate enlargement in heart’s walls or chambers as well as heart defects and other heart abnormalities.